Many poor Muslims, along with a large number of the lower castes of the Hindus and the tribal groups form the economically backward class within Uttar Pradesh people. The government of Uttar Pradesh has been working on the upliftment of the scheduled tribes and the minority communities of people. The five major tribal communities living in the state are Tharus, Bhoksas, Bhotias, Jaunswaris and Rajis termed as scheduled tribes. But however generally the people are noted for their hospitality and culture for they very much stick on to their tradition irrespective of their communities. The people of Uttar Pradesh are known for their social and political involvement right from ancient period and their contribution to the Indian Politics is always noted. The majority of the population of Uttar Pradesh belongs to the Indo-Aryan origins and their sub sects. However most of the people fall under the chain of the Aryan race who have split from those separated from Iran. There are people belonging to the traces of Mongoloid also who are in minority and they occupy the area in hills and foothills of the state, where most of them have confined themselves to the districts bordering Nepal. The ethnicity of the Uttar Pradesh people also shows a blend of Indo-Aryan and Indo-Scythian tribes namely, the Jaats and the Gujjars who live in the Western Uttar Pradesh. But however these people belonging to the mix of Indo-Aryan and Indo-Scythian tribes have physical features very much similar to that of the people settled in Oudh and Eastern Uttar Pradesh. Rohila Pathan is a group of tribes who claim that they have their lineage to the tribes of central Asia such as Mongols and occupy the Rohilkhand region of central UP. The culture of the people of Uttar Pradesh is very much fascinating and captivating. The people are known for their rich cultural heritage where they adhere to their traditional customs and practices. Apart from its natural gifts the people have nurtured a rich heritage of cultural elements. The people of Uttar Pradesh take the pride of bestowing the two great epics in Indian history namely Mahabharata and Ramayan.The culture of Uttar Pradesh, thus, has rightly imbibed this trend and manifested it in its various features. It is highly essential to mention about the fairs and festivals celebrated by the people which gives a glory to the culture of the people. Apart from the national festivals like Holi, Diwali and Makar Sankranti which are celebrated with great fervor the people also fete on many regional festivals and fairs like Taj Mahaotsav which attracts people from all over the globe. This festival recalls the inheritance of the Mughal era by displaying the fine marble replica toys of the Taj, Mughal jewelry, 'zari' clothing and much more. The festival of Kumbhmela is celebrated with following of religious practices and traditional customs. During the months of October- November the Ganga festival is celebrated on the banks of the river Ganga and the same is worshipped. The other major celebrations of festivals and fairs include Lucknow festival and Bateshwar fair. Most of the festivals here are accompanied by events like kite flying, chariot race, and pigeon flying which are memories of the Hindustan Nawabs and is an integral part of the festival. The people of Uttar Pradesh follow the ritual or more than that they make it compulsion in one's life time of taking a dip in the holy water of river Ganga and Yamuna. They believe that by having a bath in this holy water they get purified from all the sins they have committed in their life time. Aarti is another important ritual which is followed in the Ganga ghats. The deities are offered with light from the wicks soaked in purified butter in a very grand manner. Havan is a ritual performed by the people of Hindu community. It involves lightning of holy fire or the Yagna and the belief is that by doing this all evils and ill -wills are thrown apart. It is considered very auspicious among the Hindus to perform a Havan for the prosperity and the good luck before starting of any new work. This puja is conducted by the chief priest and during which lots of mantras are recited. There is also a traditional belief of frog marriages to usher rains in case of delayed monsoons. According to Hindu rituals when the marriage is performed, the Gods are pleased and rainfall takes place within days. They also believe in rolling of children on the grounds so that Indran, God of Rains is pleased and blesses the people with a good shower. They follow the patriarchical system of society or social structure. The traditional costume of the people of Uttar Pradesh includes sari with a blouse for women or salwar kameez and men opt for dhoti or Kurta and pyjama. Men also prefer a topi or pagri on their head.Sherwani is a more formal male dress and is frequently worn along with chooridar on festive occasions. Sometimes in case of formal occasions the men adorn themselves with a long coat. The women also wear lehengas, which is a long skirt and a long scarf known as orhni and this is used to cover their head and the torso. The ghagra choli is a unique costume of most of the states in North India which also includes Uttar Pradesh. This is a long skirt with a narrow waist that looks like an umbrella at the base. These skirts along with the top are called as Ghaghara choli which comes in vibrant colours and decorated with glittering mirrors. Usually the length of the skirt stops much before the ankle so that the accessory worn in the leg is visible. The women folk of Uttar Pradesh prefer accessories like gold chains, necklaces, bracelets, bangles, rings, earrings, anklets and tiaras, made of diamonds, platinum or other precious stones. 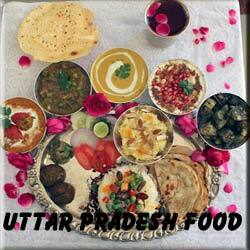 -The people of Uttar Pradesh are highly influenced by the Nawabi cuisines. The most highlighting feature of the food of Uttar Pradesh is its 'Dum Pukht' process of preparing food where the food is sealed in large pots and placed on a slow fire and cooked. Once the lid is opened an aroma emanates. 'Dastarkhwan', the ceremonial tradition of laying food on the table and a celebrated tradition of nawabs transcends the traditional cuisine into a fine-art. The people of Uttar Pradesh prefer more of vegetarian food and some of the items which is a part of their daily food are dal, roti, subzi and rice. On festive occasions, Pooris and kachoris form a part of their menu. Tahri cooked with rice and lentils and Nargishi kofta made with cheese, Khoya and saffron are very famous among vegetarians. The Muslims of this area are known for their Kebabs, Biryani and Nihari. Rampuri Rohu and Zamindoz items made of fish are also a favourite of the people. Pethas are popular sweet item of the people.Among the drinks Lassi and Ruh-afza are the most favored one in Uttar Pradesh. 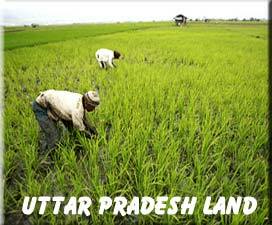 Agriculture is the main occupation of the people of Uttar Pradesh and some of the major crops grown here include wheat, rice, maize, sugarcane, oilseeds, potatoes, cotton, tobacco, jute and pulses. They also manufacture woollen clothes, leather, cotton and flour. Cottage and village-based industries like weaving, leather, woodwork, ceramics, silk weaving and perfumery are the other important industries of the state. Paramhansa Yogananda -mystic who introduced Yoga in the west, Gorakhpur. Rani Lakshmibai -the Rani (Queen) of Jhansi. Govind Ballabh Pa -Indian independence fighter and politician, became Chief Minister of the United Provinces. Also Bharat Ratna recipient.